Phoenix Petroleum gives back this Christmas. 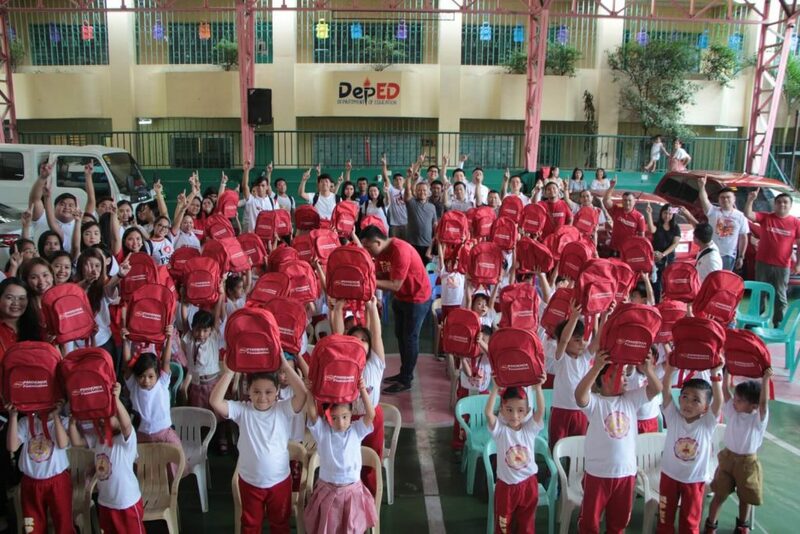 Kindergarten students from the Rafael Palma Elementary School in Pasay City raise their Phoenix Foundation backpacks in Phoenix’s annual gift giving and book donation program. This year, 32 elementary schools across the country benefited from this program. 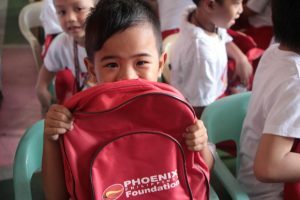 This year, Phoenix Petroleum made the holidays happier for 4,000 children as they received Christmas gifts and educational books through the Phoenix Philippines Foundation. Phoenix donated story books, reference books, and instructional books to 32 elementary and kindergarten schools all across the country while smart TVs, chairs, computers, and fans were also donated to selected schools. The students received school bags, school supplies, toys, and snacks from the oil company. The number of schools who benefited from this gift-giving program has grown this year. Phoenix has donated to schools in Batangas, Pasay City, Calapan, Olongapo, Aklan, Iloilo, Mandaue City, Cebu, Davao City, South Cotabato, General Santos, Misamis Oriental, and Zamboanga City. Since 2008, Phoenix Philippines Foundation has also been helping schools through the Phoenix Adopt-A-School program, a partnership with the Department of Education to donate school books and teaching materials and contribute to teachers’ salaries to schools across the country. During the Christmas season, Phoenix employees visit their adopted schools as well as schools nearby their depots to spend time with the students. The Phoenix Adopt-A-School and book donation program will continue to grow and touch more lives. “As Phoenix Petroleum continues to expand its operations in the Philippines, Phoenix Philippines Foundation commits to expand its programs to reach other parts of the country,” Zorrilla said. The motivation of Phoenix Petroleum to give back and share the company’s blessings to communities inspires Phoenix employees to be active participants in the company’s CSR activities every year. Other than education, the Phoenix Philippines Foundation also has programs on health and safety, environment, and outreach. A kindergartener smiles behind his Phoenix Foundation backpack in a program where Phoenix employees spent time with the students and had games, food and performances.